Check out Lava, our August 2013 theme release! Inspired by the modern flat style, we cooked up a fresh, clean and spacious design that will serve perfectly to present your company or portfolio site. It is bright, colorful and extremely versatile, making it an excellent blueprint for all kinds of web creations. This theme is packed with great features. The fluid wrapper is extra-wide and displays beautifully on large screens. A smooth off-canvas navigation lets visitors browse comfortably through your site on their mobile devices. A neat sticky navbar attaches itself to the top of the page when scrolling, so that you can easily reach it from everywhere on the site. Smooth animated buttons, a sliding search and a nice image overlay give an overall modern and interactive feel to the theme. Optionally, modules can spread over the full width of the wrapper, which is great to display images or slideshows "framelessly". 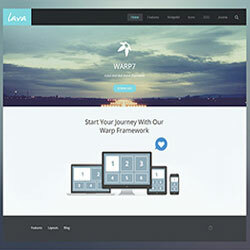 Lava is based on Warp 7 and provides full support for LESS. The front-end is completely built with UIkit and can be modified through the Customizer. You can change colors, spacing and fonts without having to write a single line of code. To get you started, Lava already provides 8 different style variations to choose from.